Kabul (afviews): Afghan civilian causality in NATO airstrike, become the first immediate challenge to General Joseph Dunford, the new US and NATO-led International force in Afghanistan, as he's been summoned to Afghan President Hamid Karzai's office for discussing an end to civilian casualties. 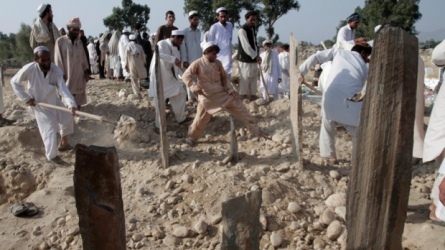 He has only been in charge for a few days, when a coalition airstrike in the eastern Afghan province of Kunar on Tuesday February 12th killed 10 civilians, including five children and four women. 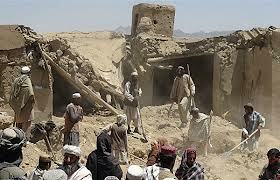 Although, four Taliban commanders were also killed in the strike but civilians were the real victims. Following announce of an investigation into the civilians killing, general Joseph Dunford commander US Forces Afghanistan, met with the Afghan President Karzai to provide his insights into the Afghan and Coalition forces partnered operation. In meeting with president Karzai, Gen. Dunford explained that the Coalition takes all allegations of civilian casualties seriously. 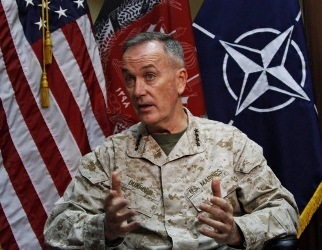 "Because we understand that protecting Afghan civilians is the cornerstone of our mission here in Afghanistan, Gen. Dunford reaffirmed the Coalition's commitment to taking every step possible to ensure that we conduct our operations in a way that further reduces the number of civilian casualties," the statement said. In a separate statement president Karzai's office said that Gen. Dunford explained that the coalition and Afghan forces were targeting members of al Qaeda when they summoned air support to the province. "Pointing to an earlier commitment not to conduct any air strike or bombing in residential areas, President Karzai reminded that such incidents must strictly be avoided in future and any recurrence is not acceptable," the statement from Karzai's office said. The reported attack came as President Obama announced Tuesday in his State of the Union speech that he will withdraw about half of the 66,000 US troops in Afghanistan within a year, a step toward withdrawing all foreign combat forces by the end of 2014. Civilian casualties especially as a result of NATO or US airstrikes - have been one of the most toxic political issues in Afghanistan over the last few years. Karzai has long called for a ban on airstrikes, and responds to US and ISAF strikes that kill civilians with especially sharp criticism. Note: You must preview your comment first before finally posting.